This month's Pro Tools workshop is the first in an occasional series where we'll take a detailed look at one of the more complex plug-ins that Digidesign distribute. First up is the TL Space convolution reverb plug-in, which is available in both TDM and RTAS flavours. As with all of their plug–ins, a 14-day demo of TL Space can be downloaded from the Digidesign web site (see the 'Links' box), so if you're curious, you can install the demo and use it in conjunction with this workshop, even if you don't yet own TL Space yourself. The TDM version actually comes as three different plug-ins, Short, Medium and Long, which offer progressively longer reverb times at the expense of using more DSP. The longer versions can 'bridge' multiple DSP chips in one instance of a plug-in, up to a limit of eight DSPs for a quad input/true stereo output instance, but the maximum reverb time available in the TDM version is 3.4 seconds. If you want to hear the nuclear cooling tower in all its glory, then, you need to use the RTAS version. This is included with the TDM version as well as being available as separately, and uses the host computer's processing power instead. At a mathematical level, convolution multiplies every sample in one waveform or impulse by the samples in another waveform. When that second waveform represents an 'impulse response' created by recording the decay of a gunshot or sine sweep, it can be used to apply reverb 'sampled' from a real acoustic space. Once you have an impulse of your favourite space and put it into a convolution reverb, the result will sound as if the audio was played in that space. However, you can actually use anything you like as the impulse response: for a wacky example, try convolving someone saying 'Hey' with a snare drum hit. You will find that the snare drum says 'Hey' each time it is hit! It's worth being familiar with TL Space's Preferences page. The 'Embed IRs' option is particularly useful if you need to archive your Sessions and open them on other machines.Let us move on from the theory and take a look at how TL Space implements these principles and how you can use them creatively. The top half of the TL Space interface is the display section, and can be switched between any of four modes. Waveform displays the impulse response waveform, while Picture Preview shows pictures of the location in which the IR was created. The third page is Snapshot: TL Space offers up to 10 Snapshots that store the IR waveform and all the control settings, and has been optimised for very fast loading. Switching between these snapshots can be automated, so enabling the user to program TL Space to change 'environments' very easily with a single automation function. The final page is Preferences. Among other things, this allows you to turn on and off the feature that embeds the IR waveforms in the presets and Session file. This feature is very useful when transferring Sessions from one system to another, as it means you don't have to remember to copy the impulse library too. The 'PCI throttle' on the TDM version is there to help if you get any dreaded -6042 errors, especially when using PCI video capture hardware. The meter section stays visible all the time and will display the appropriate number of meters depending on the input and output configuration chosen by the user. The five pages shown in the bottom half of the screen display the controls used to vary the settings. The first Levels page gives you separate control over the levels of the early and late reflections, and if you have a surround instance of TL Space, then on this page you will also see controls for Front, Rear and Centre levels. The second page deals with Delays. 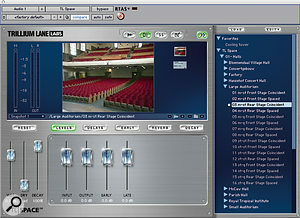 TL Space goes beyond the normal pre–delay that most reverb units offer and provides separate control over the delay time of the late reflections. The surround version also features controls for the front, rear and centre delays of up to 200ms. The Pre Delay control offers between -200ms and 200ms of delay: negative pre-delay values can bring about subtle or radical changes to the sound. Small amounts of negative pre-delay will mean that the plug-in does not use the 'early reflections' part of the impulse response, while larger amounts of negative pre-delay enable you to isolate the end of the reverb tail as a reverb in its own right, in a way not available on conventional reverb units. The third page is dedicated to the Early portion of the impulse response (IR), and so the early reflections of the resulting reverb. The Length control determines what TL Space will consider to be the early part of the IR. It is best to adjust this whilst viewing the waveform display; you will see that as you adjust the Length control, the section of the IR that TL Space allocates as 'early' is highlighted. The Length value is specified in 'm' rather than 'ms', but is actually measured in milliseconds, not metres! On this page you can also adjust the relative volume of the early reflections, with the Size control, and enable a high-pass filter to reduce the low-frequency content of the early reflections. This can help with low-frequency boom in the reverb path and reduce LF cancellations when mixing reverb back with the dry signal. Finally, there is a Balance control, which enables the user to adjust the left/right balance of the early reflections. This control will help with the apparent position of the reverb input in the stereo image. The fourth page, Reverb, controls the reverb 'tail' section of the IR. High- and low-frequency shelving EQs both have frequency and gain controls, and are prior to the convolution process in the signal chain. The Width controls the perceived stereo spaciousness of the reverb tail, but remember that if there is relatively little stereo content in the IR, this control won't have much effect. 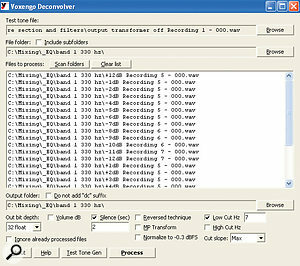 Balance controls the position of the reverb tail in the stereo image and, finally, the Reverse control reverses the IR waveform and will also control the total length. Again, it is best to adjust this whilst viewing the waveform display; very helpfully, this control displays its results in beats per minute, to help the user sync the reverse effect with the tempo of the piece. Any impulse response longer than five seconds will be truncated when Reverse is used. Finally, the Decay page allows users to control the decay of the low-, mid-, and high–frequency elements of the IR, using a three-band crossover-type EQ section. When using the surround version there are separate controls for the front and rear channel decay. 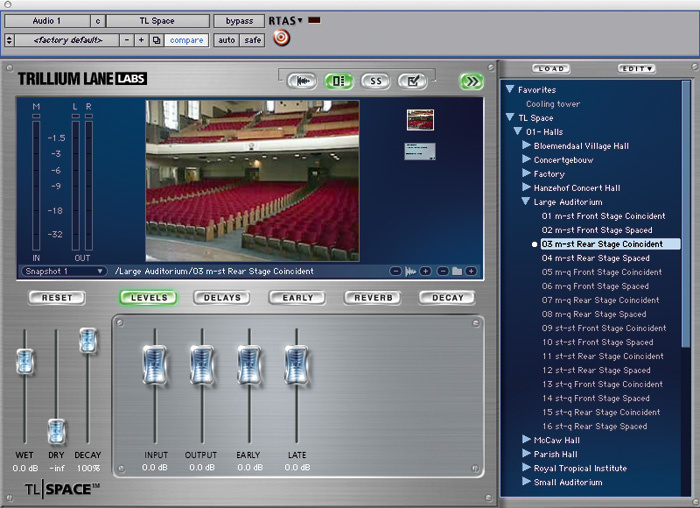 The boxed version of TL Space comes with a good selection of IRs, but if you are downloading the trial version of TL Space from the Digidesign web site you will need to download some IRs to get you going. All the IRs are available from the Digidesign web site, and as well as the Core packages that are supplied with the boxed version, there is a range of additional packages. Notice that most of the files are large, so be aware of this when downloading. Once you have downloaded some IR packages, check that the downloaded file has been 'unzipped' and you know where the IRs are on your system. Open the IR Browser within TL Space, click on the Edit button and a menu will appear. Select Install TL Space IR Package and a navigation window will open. Navigate your way to where you left the unzipped file(s), which will be in the proprietary '.tls' lossless compression format, and install that package. You can repeat this process for as many packages as you have. Note that TL Space puts its own IRs into a special folder on your system. You aren't restricted to Digidesign's own libraries, however. TL Space reads a wide range of IRs, including WAV, SDII and AIFF, with sample rates from 22kHz to 96kHz and bit depths from 16 to 32 bits. TL Space also supports JPEG files for the location images. To use IRs in these formats, choose the 'Import Other IR Folder' option from the Edit menu in the IR browser. You will need to make sure that your third-party IRs are pre-arranged in a folder, as TL Space won't import single audio files that are not inside a folder. I downloaded a number of IRs and grabbed the relevant images from the web sites too. For example, I downloaded a response from a nuclear power-plant cooling tower, created a folder called Cooling Tower, put the IR and the JPEG inside it and pointed TL Space at that folder. TL Space read both the IR and the picture. Note that when importing third-party IRs, TL Space doesn't copy them to its own folder, so you shouldn't move third-party IRs once you have imported them. I have a dedicated folder on the same drive I store all my samples and sound effects and I make sure they are managed in the folder format that TL Space understands. Although TL Space accepts a wide range of IR formats, you cannot import IRs from Altiverb after v4, Waves IR1 or the Sony hardware convolution processor amongst others; all these rival manufacturers keep their IRs in a proprietary format to protect the work they have done in acquiring quality libraries. There is, however, a good number of sites offering free IRs, although the quality varies — some have missing reverb tails or left-over sweep tones in them. There are also commercial IR libraries from companies like Numerical Sound and Spirit Canyon Audio. For more details and reviews of these and others, have a look at the article on convolution processing with impulse responses in the April 2005 issue of SOS (www.soundonsound.com/sos/apr05/articles/impulse.htm). The real fun with convolution lies in recording and using your own impulse responses, which isn't as difficult as it sounds. At its simplest, all you need to do is create an impulse sound like a gunshot from where you'd like the sound to originate from in the space, usually the stage, and record it by putting the mics where you want to listen to the sound, usually somewhere in the audience. The first issue is how to create a suitable impulse sound — if you are going to create an impulse that requires no post-processing, some sort of impulse sound (as close as possible to the theoretical ideal of an instantaneous sound containing all frequencies at once) is going to be necessary to excite the space. Handclaps are not really suitable, as the attack isn't really good enough. Some people pop balloons, but unless you use really big ones, there won't be enough low-frequency content in the impulse. The oldest technique is to use a gun, and I have heard that some people work with a power-actuated nail gun that uses .22 blanks to fire a nail into concrete! However, using an actual gun — even a nail gun or starting pistol — probably causes more problems than it solves in the current climate. Other options include banging two books or wooden blocks together, but both will tend to produce a coloured sound. Most professional impulse response libraries are recorded instead using a swept tone file. This method requires good-quality audio playback technology to replay the sweep tone accurately within the acoustic space to be sampled. You then record the sound of the swept tone in the room, and use a so-called 'deconvolution' algorithm to extract an impulse response. If you run a Mac and have Apple's Logic you already have the tools to do this: for a detailed guide, read the February 2008 issue of SOS (www.soundonsound.com/sos/feb08/articles/logictech_0208.htm). 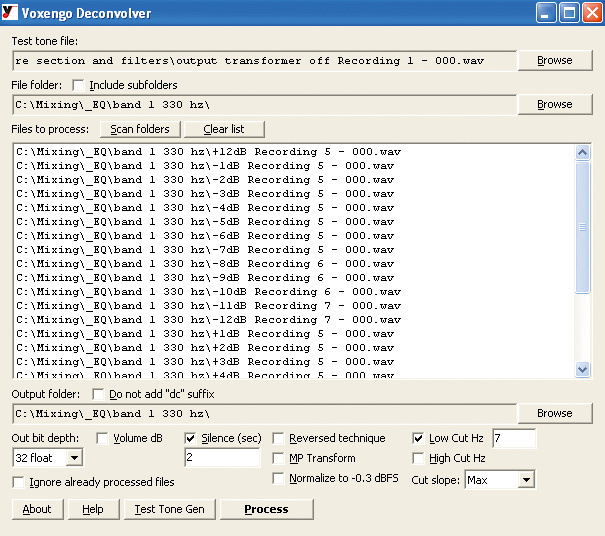 The inexpensive Voxengo Deconvolver is a PC utility that can create impulse responses from recorded sine sweeps.PC users shouldn't feel left out, as there is a Deconvolver application from Voxengo that will take a recording of a swept sine wave and convert it into an impulse response. The full version of Deconvolver only costs $39.95, and there is a free demo version that will allow three conversions per session. 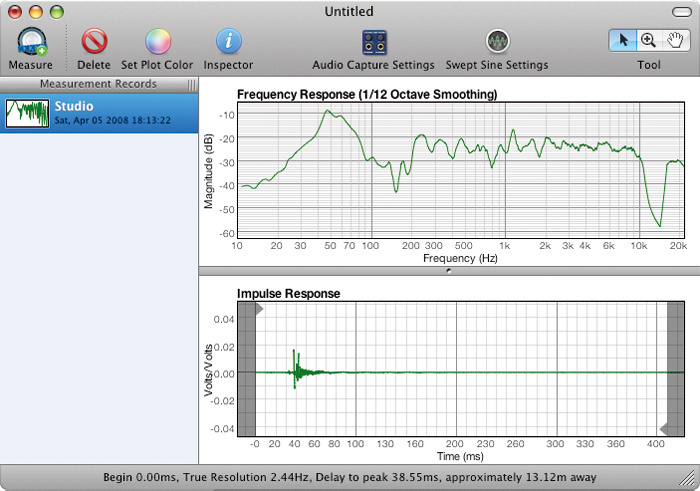 FuzzMeasure Pro is a Mac utility that can 'deconvolve' a sine sweep to create an impulse response suitable for use in TL Space.For Mac users without Logic, the best solution is a software package called FuzzMeasure Pro. The current version (v3) requires Leopard, but the nice people at Supermegaultragroovy can supply a copy of v2, which is designed for Tiger, and will be what most of us Pro Tools users will need at this time. It currently costs $150, with a 14-day demo available, and it should be remembered that it is really an acoustics analysis application. However, IR recording and analysis functions are all built into the application, and once you have swept your chosen space it is possible to export an impulse response, which you can then import into TL Space or any other convolution reverb. Remember to take pictures of the location, so you can see it when you select it in TL Space! My first attempt at using FuzzMeasure Pro worked, but there was some low-level echo long after the main sound had finished, and the processed sound was quiet. So I imported the impulse I had made into Pro Tools, normalised it so that the impulse would be as loud as possible, then trimmed the front tight to the start of the impulse and finally trimmed the tail back to the impulse. I exported this file back to my impulses folder and re-imported it into TL Space. Both problems were solved. The processed sound was much louder and the low-level delayed echo had gone. The moral of this experiment is to always clean up your impulses before loading them into your convolution reverb. It's worth remembering that you can 'sample' other audio gear, as well as acoustic spaces. The basic rule is that any linear process that is not time-variant can be successfully captured as an impulse response. This rules out compressors, distortion circuits and modulation effects such as chorus or flange, but includes reverbs, delays and loudspeakers, among other things. The easiest way to excite effects units and get an impulse response from them is to hit them with a single full-level sample, record the output, and use that sound as the impulse response. This way you can recreate patches from classic hardware reverb units and other effects processors and have them in a Pro Tools Session without having to own one of these classics. You should be able to track down impulse responses of most of the classic units on-line; indeed, quite a few come with TL Space, including the EMT250 and AMS RMX16. You can extend this principle and take impulse responses from guitar amps as well as things like telephones and car radios. You can even take an impulse from a film location, so that when the dialogue is later replaced you can use a convolution reverb to process the replaced dialogue to match the original location. The TL Space Post Production set has a very good range of locations, and another set I find useful in post-production work is called Tiny Spaces and includes environments such as flowerpots, glass cups and a hose from a vacuum cleaner. For those who might like to walk on the wild side or are into sound design there is a huge range of experimentation open to you by trying other sounds as impulse responses — I already talked about the idea of using a vocal 'Hey' as an impulse to process drum samples. Try taking the impulse response from the resonance of a violin body or piano soundboard, which can help sampled or synthesized sounds feel more natural. Using a drum loop as an impulse can produce some very unusual echo effects: pad sounds will result in drones and background textures, whilst short files produce complex comb–filtering sounds. You could even draw your own impulse responses using Pro Tools' pencil tool. Have fun and experiment!